When we started RetroDuck in 2003, we had no idea what screen printing was. We were in the business of vintage t-shirts, and though we'd had custom t-shirts made before, the concept of screen printing (also known as silk-screening) was completely foreign to us. This posed a bit of a problem when, in 2004, we decided to get into the business. We had to learn from the ground up, which ended up being a good thing. Though the process hasn't changed much over the years, the equipment and materials used in the process are constantly evolving. 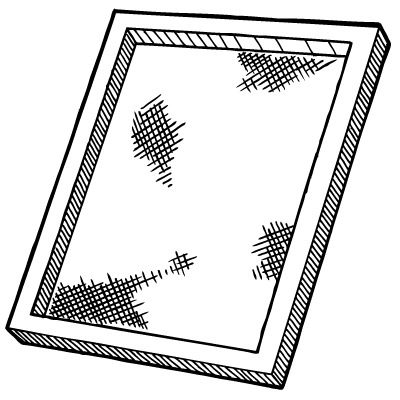 A Screen: Usually silk mesh stretched over a wooden or aluminum frame. Just think of a screen that sits in your window, only with a much finer mesh, and made of a much softer material. Pictured: a typical frame size, sometimes around 2 ft. on each side. 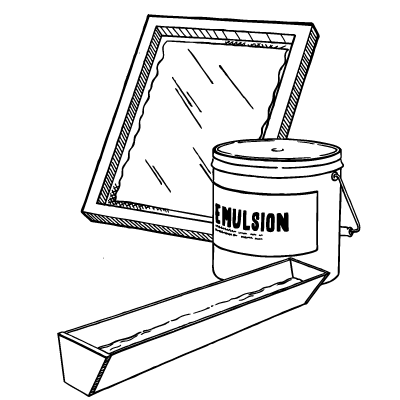 Emulsion: This is applied to a screen; to the mesh, and is sensitive to light. As such, it must be kept away from natural light while it waits to be used in production. Some emulsion is liquified, while some comes pre-hardened in sheets. There are many kinds of emulsion, but most operate in the same way. Pictured: liquid emulsion, along with a "scoop". This type of emulsion is applied to the screen using a scoop. Also pictured is a screen that has been coated with emulsion. Your Image: Regardless of which color you intend to print, you must have a black image which you will use to create your stencil. Pictured: We don't have a lot of customers who ask us to print our Duck on their shirt - but it HAS happened!. Vellum/Transparency: You will need to print your image on Vellum, or an opaque paper medium, so that the image can be properly exposed onto the emulsified screen. 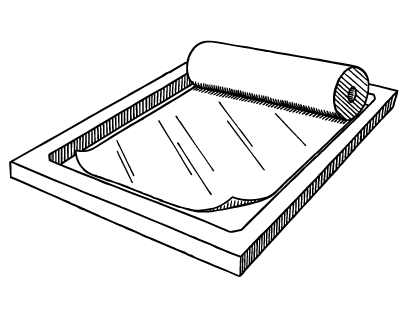 Pictured: A roll of Vellum laid out on a screen. Vellum can also be purchased in individual sheets, just like printer paper. 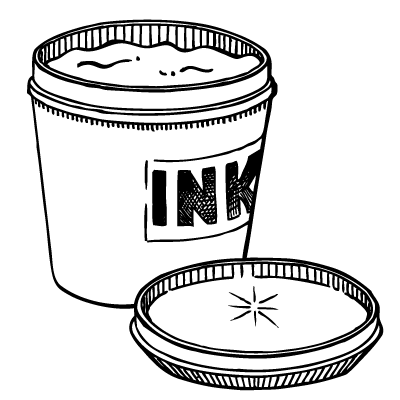 Ink: Most screen printers use either plastisol based inks, or water based inks. There are many other varieties of inks; acrylic is a popular choice for home use (since it air dries). Plastisol ink must be heat "cured"; the ink remains wet, even if left exposed to air for long periods of time. If you're using plastisol ink, you'll need some type of dryer (we don't really cover that topic here). Pictured: Plastisol Ink typically comes in gallon or quart sized containers. 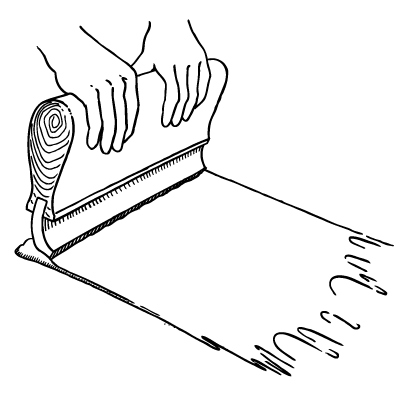 A Squeegee: This is used to push ink through the screen. Just imagine the squeegee you use to clean your windsheild at the gas station. Pictured: There are a lot of automatic printing machines, but this is the type of squeegee you'd use on a manual press. It is pulled across the screen, and pushes the ink through your stencil. You'll also need a source of exposure. Many people use natural light to "expose" a screen, but most professionals use either an ultra-violet or halogen light. "Exposure Units" can range from simple homemade units, to large vaccuum sealed units costing several thousand dollars. Other items: Professional shops typically use many more items, such as belt dryers, flash-drying units, and other items. There are a lot of choices for screen printing apparel, but now you know the basic elements! Here's how it works: starting with a clean screen, you apply your emlusion. This can either be liquid emulsion, or sheets of pre-dried emulsion; there are many different options. Next, you apply your image to the screen, typically secured with simple scotch tape. Now you are ready to expose. You will use your chosen exposure method, which will harden all emuslion that light touches. While the light hardens the emuslion, your image will block light wherever it touches the emulsion. Once your exposure period is done (the amount of time will vary based on your emlusion and exposure method) all emulsion that the light has touched will remain on the screen. All of the emulsion that has been blocked by your image will have remained soft, and will be sprayed out with water. As long as your exposure was successful, there will be a perfect replication of your image left in the screen. You will now use a squeegee to push ink through the screen on to your t-shirt, beer koozie, or whatever your want to print. This is a greatly oversimplified explantation of the process; there is a lot of trial and error, and there is a bit more to it, but that's the basic process! If you are ever interested in learning more, we know a bit, so just ask us! You can learn a lot more about the History of screen printing at Wikipedia.